I have been in Chesham exactly 5 years this month. How’s that for an anniversary?! I set up here as I knew the previous owners of Domesco and always liked the company. I have been in this industry since 1981 and know the domestic appliance market very well. I started small with only a few stock items and delivering in my car. Later as the business grew I was able to hold more stock and bought the van that you see all around the area. I deliver to all the surrounding areas and its all part of the service. I have always been interested in photography and have recently achieved my LRPS with the Royal Photographic Society, which is no mean feat! I am also a member of the Amersham Photographic Society and a previous member of the Wycombe camera club. I used to do my own developing and have now embraced the digital age. I enjoy taking photographs of wildlife, aviation, and coastal scenes amongst many other subjects. I am also trained in ballroom, latin and disco dancing. It’s a lovely town with beautiful countryside, within two minutes you can be in stunning countryside. There is a charming mix of the old and new town with some great shops with lots of independent shops. There are lots of lovely customers who appreciate using an independent retailer. They like the quick and personal touch, honest advice and all the models in the shop are fully working for demonstrations. 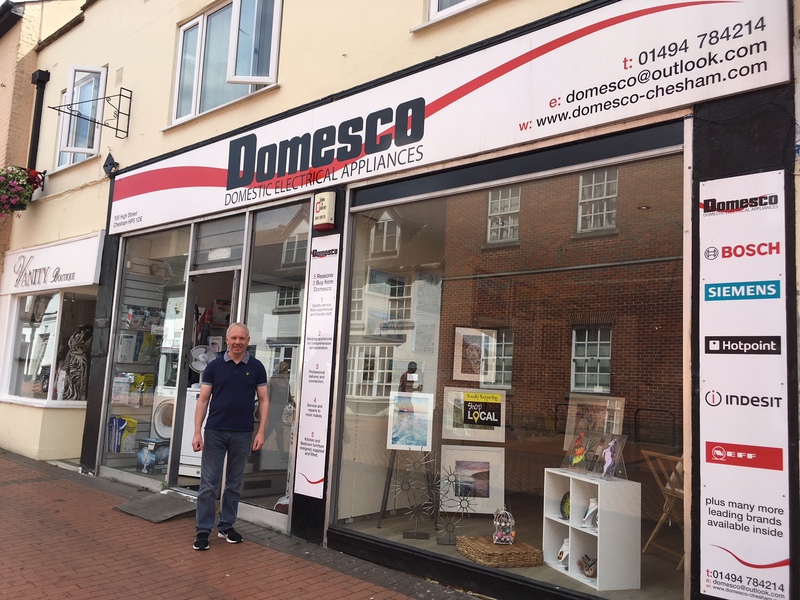 I also have lots of great relationships with other businesses in the town, such as C P Summers who does installations, Potter and Ford and Hadlands, who I help by arranging appliances for tenants. I have always wanted to open an art gallery. I have always had local artists display their work alongside my appliances but I have decided to take this further. I have moved some stock into other parts of the shop and have created a new smaller version of Artworks, the pop up community art gallery you may remember from a few years ago. So we have artwork in all mediums, glass, metal craft, leather work, flowers all from local artists. So do pop in, there may be things that will surprise you. I am arranging a fund raising event in November to coincide with Children in Need – I’ll publish more details of how to get involved nearer the time. So we still have the same extensive stock but we have art as well – a perfect but unusual combination!